Thanksgiving is the biggest food day of the year, and some estimates suggest that the typical American holiday meal can pack in more than a few days’ worth of calories. Here are six ways to avoid holiday overeating. I use them every year to help me be able to enjoy the holiday season–while keeping my waistline intact. Exercise in the a.m. Before I start roasting the turkey and preparing all the side dishes that I’ll be serving, I make sure that I attend a CrossFit class or do a trail run. There are many local road races to do and getting your exercise in will give you extra calories in your daily budget and will help your body be able to handle the excess calories you’ll be eating later in the day. Eat breakfast. You may think it’s a smart strategy to skip breakfast but it will likely backfire because you’ll be so hungry, you’ll overeat even more at the holiday dinner. Instead, I’ll have a high-satiety breakfast like oatmeal or eggs. Here are some of my favorite calorie-controlled, high-protein first meals. Limit (or avoid) alcohol. If you avoid drinking or limit yourself to one drink, it’s less likely that you’ll overeat. That’s because alcohol stimulates your appetite and increases the desire for high-calorie foods. I rarely drink and don’t plan on doing so this season. Have a plan. Before your main meal starts, have a plan for what you’re going to eat and how much. 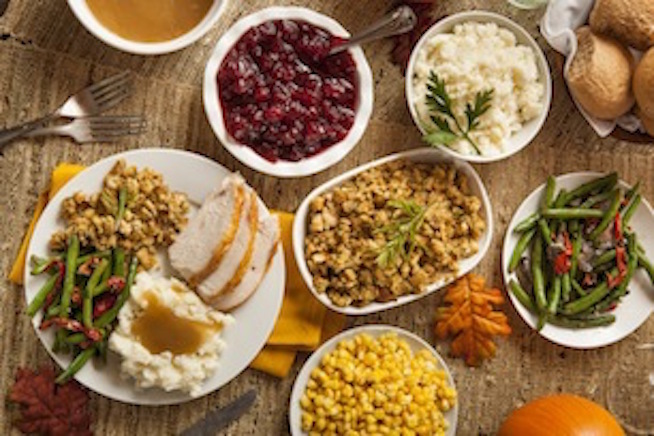 Try to keep your plate balanced by having half of your plate filled with veggies, one quarter from protein like turkey and one-quarter from grains like a whole grain side dish, roll or stuffing. Wait before eating seconds. Give yourself about 15-20 minutes to see if you really want seconds because it takes that amount of time for your stomach to signal to your brain that you’re satisfied. If you’re still hungry after 20 minutes, then it’s okay to have more. In most cases, you’ll realize that you’ve had enough. Bring your own healthy dishes: If you’re going to a family member’s home, and you’re concerned that there won’t be anything healthy to eat, bring a dish or two that you like that won’t derail your diet. For example, I usually take a salad, a fruit salad for dessert and sparkling water.